Looking for a last-minute winter getaway? Put Mexico City at the top of your list. The bustling metropolis—and the World Design Capital of 2018—has bounced back from September’s earthquake. You could spend at least a week eating your way through its many food halls and local markets, visiting museums (it’s home to more than any other city in the world) and wandering its tree-lined neighborhoods. While there are top-notch hotels, Airbnb is often the more affordable way to go. And as you’ll see from this list, stays are often super stylish and come with incredible outdoor space. This one-bedroom, one-bathroom studio is ideal for couples that want to cozy up in a quiet escape. It’s a bit outside of the popular areas of Condesa and Roma, but that only adds to its romantic appeal. (Plus, Uber can get you anywhere fast and cheap.) The space is compact, yet the owner designed it with care, outfitting it with bright red bar stools, a white-tiled kitchen and a lounger that faces a private garden oasis that’s teeming with plants. A staircase leads up to a simple yet comfortable sleeping area. What’s more, the price is hard to beat. Rates from $70 per night, minimum-night stay varies. Mexico City’s historic center brims with history and things to see and do, including the Bellas Artes, National Palace and Zócalo (or main square) — and this restored 18th-century one-bedroom, one-bath hacienda puts you right in the thick of it. 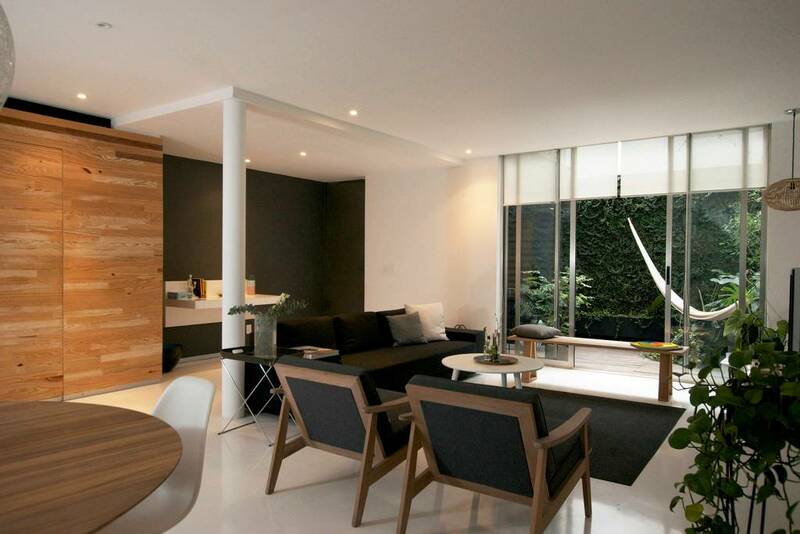 Its all-white interior is paired with light wood furniture, making it feel clean, fresh and very hotel-like. The apartment (which is big enough for four) is connected to the one-bedroom Casa El Santo by an interior garden and they can be rented together for larger groups. 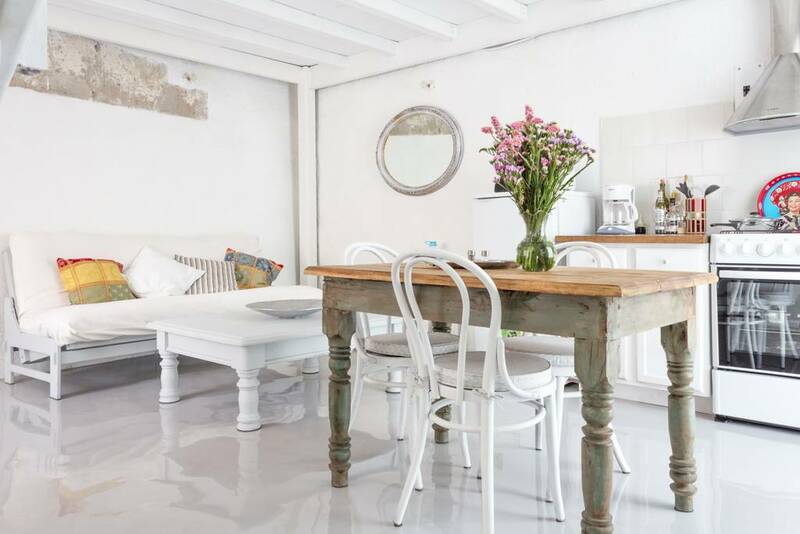 The hosts also manage a number of other Airbnbs in the area that can hold up to seven guests. And they can provide you with a cellphone upon request. Rates from $99 per night, minimum-night stay varies. 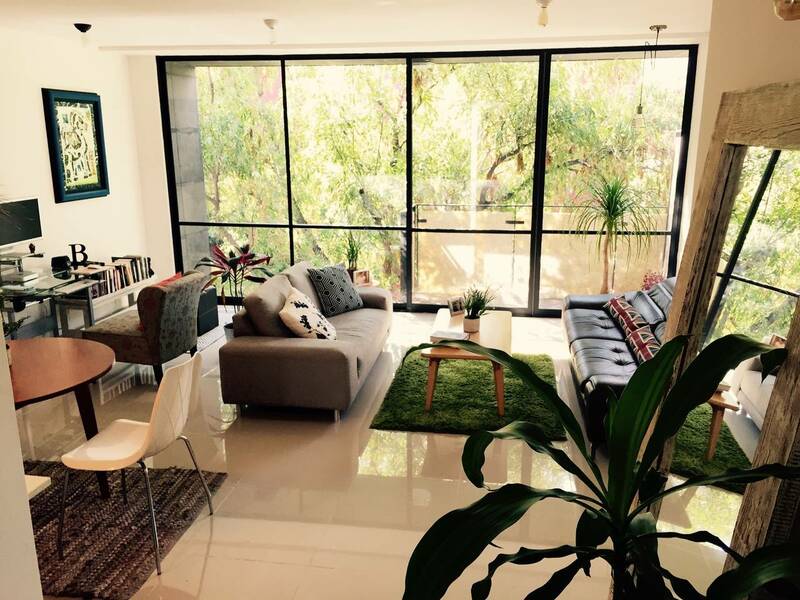 The #1 rule of real estate — location, location, location— applies to this spacious two-bedroom, 2.5-bathroom rental in the Cuauhtémoc neighborhood, which is close to Condesa, Roma, all the sights in Chapultepec park (including the National Museum of Anthropology) as well as the Centro Histórico. There’s plenty of space for four guests and it’s a design-lover’s haven, with a globe-like hanging light fixture, framed art propped against the wall, wooden platform beds and open shelving in the kitchen. The terrace—complete with a green wall—has a hammock in case the desire for a mid-day nap strikes. Rates from $140 per night, minimum-night stay varies. Chances are good that having the tuna tostadas at Contramar is on your must-do list—and this bi-level rental is right across the street. Inside, you’ll find a Luis Barragan-style floating staircase, bright pink accent walls and three large and contemporary rooms (plus 2.5 baths) that can accommodate a total of eight people. There are also two living rooms and a terrace, which means plenty of communal spaces to hang out when you’re not exploring the city. Rates from $199 per night, minimum-night stay varies. 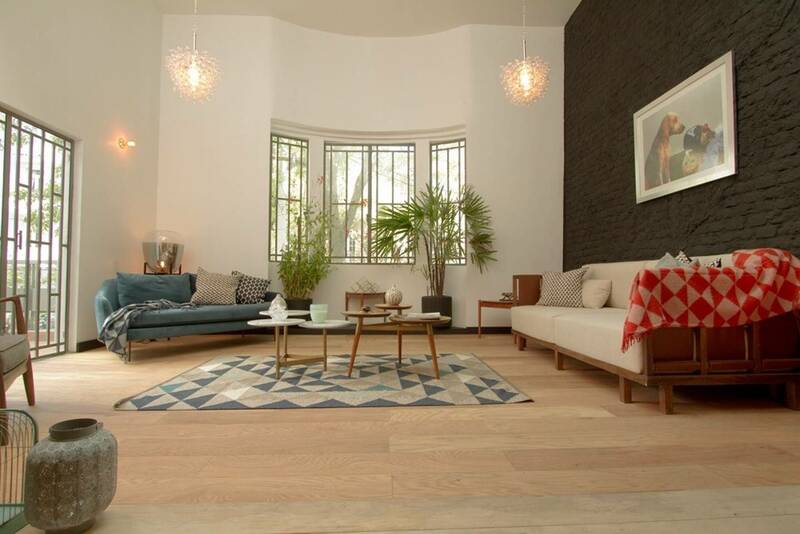 Those looking to stay in what is perhaps the city’s buzziest neighborhood should book this modern, two-bed, 2.5-bath apartment in Condesa, where just about every street is lined with restaurants, bars and boutiques. (And travelers who need to get some work done will appreciate the two desk areas, one equipped with an Apple computer and printer.) Floor-to-ceiling windows give it tons of natural light and there’s a roof garden outfitted with a Weber grill and enough seating for eight. If anything happens to go wrong, the hosts or one of their mangers are known to respond within minutes. (They also have two other rentals in the same building, in case you’re traveling with a big group.) Rates from $137 per night, minimum-night stay varies. 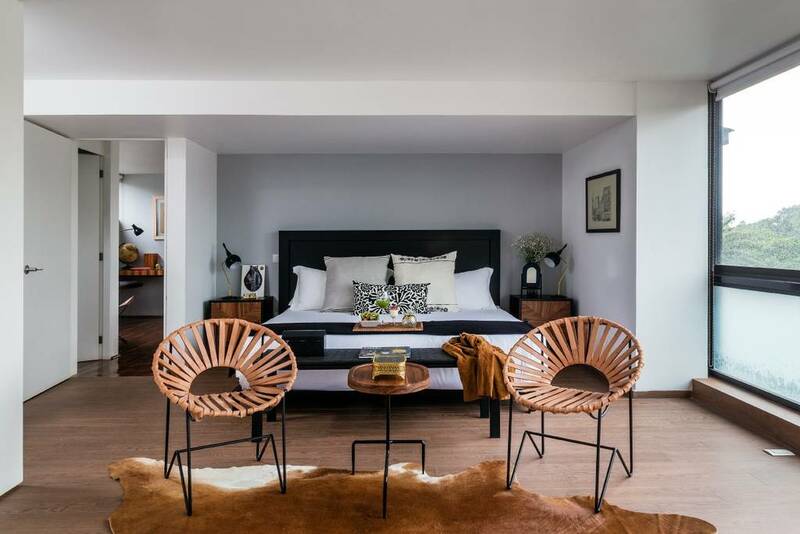 This is your chance to stay in the former studio of the late Mexican painter and muralist David Alfaro Siqueiros. An elevator opens directly into the sleek and stylish three-bedroom, 2.5-bathroom apartment (for up to eight guests), which is done up in mid-century furniture, shiny wood floors and original local art. It’s located just north of lush Chapultepec park — and there’s a terrace from which to take in the view, a mezcal or beer from the welcome kit in hand. And should you need help with restaurant reservations, babysitting services, or even a private chef, a concierge is available 24/7. Rates from $344 per night, minimum-night stay varies. 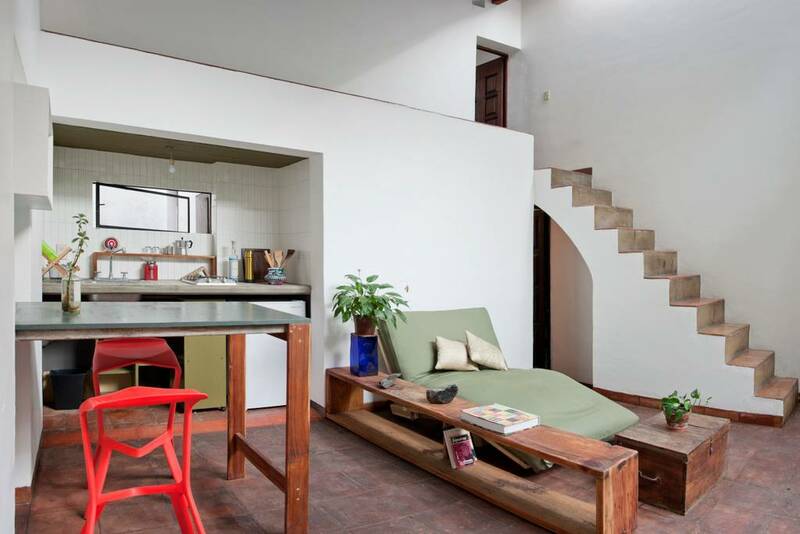 The architect and muralist Juan O’Gorman used to live and work out of this 1939 two-bedroom, 2.5-bathroom home in San Angel, a beautiful residential neighborhood just south of city. (A block away, O’Gorman built twin houses and studios for Frida Kahlo and Diego Rivera, which have been preserved as a museum.) 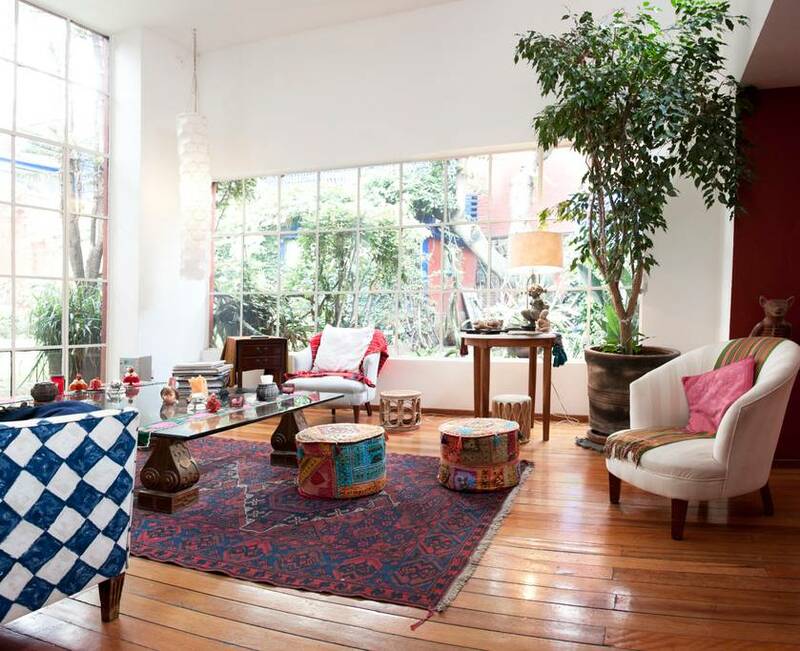 It’s eclectically decorated, with a blue-and-white checkered couch, colorful throw pillows and patterned rugs and tapestries. It can accommodate up to six guests and while in residence, the hosts sleep in a bedroom on the opposite side of the garden and you may see them in the kitchen during meal times. (A continental breakfast can be provided on request.) Rates from $328 per night; minimum-night stay varies. 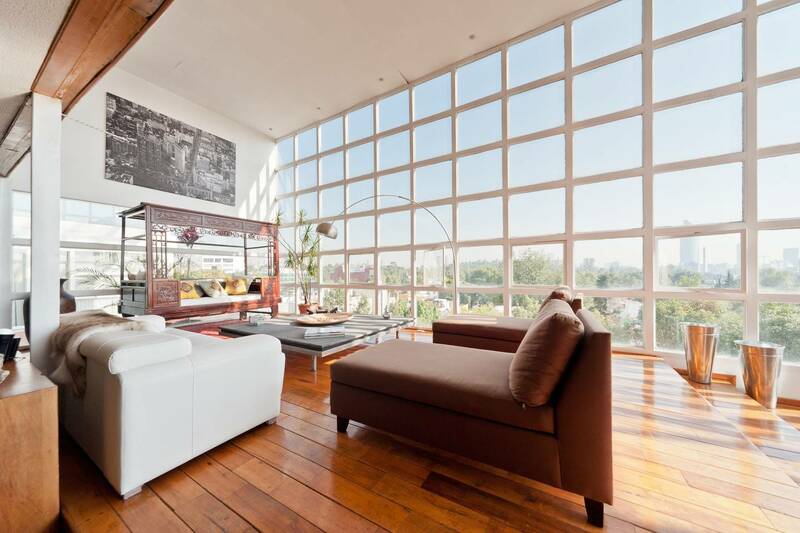 Set in the picturesque mostly-residential neighborhood of San Miguel Chapultepec, this light-filled seventh-floor apartment has soaring windows and three spacious rooms with king beds, making it large enough to fit six more than comfortably. There’s a beautiful open kitchen and dining room that overlooks the city, plus a living room with a white couch, stone coffee table and traditional Balinese love seat. Among the other amenities: an over-sized terrace, parking space, 24-hour security and a Nespresso machine. Rates from $399 per night, minimum-night stay varies. There are plenty of ways to maximize your stay with points and miles. If you’ve never used Airbnb before, sign up through TPG to get $40 off your first booking — and the gravy train doesn’t stop there. Book through the Delta portal and earn 1 SkyMile for every dollar spent on your stay and make sure to charge the purchase to a travel rewards card to rack up extra points. Using a card like the Chase Sapphire Preferred will get you 2x points on all travel purchases while the Chase Sapphire Reserve will get you 3x points on an Airbnb stay. When you combine the two, you’re effectively double-dipping with your points earning.